Samsung Galaxy S4 overview: Does bigger mean better? 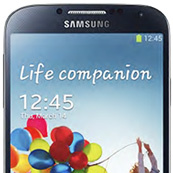 As the update to the Galaxy S III the quad-core Samsung Galaxy S4 is one the most eagerly anticipated high-end smartphones of the year, and sits at the top of the South Korea based maker’s range. The latest in a line of giant Androids, the Galaxy S4 crams a huge, 5-inch super-AMOLED full HD (1920x1080pixel) screen and 13-Mpix CMOS based camera into a slim and light case measuring 136.6×69.8×7.9mm and weighing just 130g. Achieving a DxOMark score of 75 overall puts the rear-facing camera module of the Samsung Galaxy S4 comfortably ahead of the pack. That’s no mean feat as the bunch includes the handset maker’s own Galaxy Note II and S III as well as Apple’s iPhone 4s and latest iPhone 5, all achieving a very respectable 72 in our DxOMark scores. However, it can’t quite topple the 41-Mpix Nokia 808 PureView. Sitting in the top position in our ratings that model achieved a DxOMark score of 77 points. While that model uses a larger sensor with much higher pixel count to achieve its excellent low-light scores, the Samsung Galaxy S4 can’t match that with noise reduction only. In bright light, it’s a different story. The S4 makes good use of its fast efficient AF and robust and reliable auto-exposure systems to maximize image detail from the 13-Mpix sensor and deliver images with fully saturated color. Despite good overall image quality, the Samsung Galaxy S4 still has some of the typical flaws that differentiate smartphones from the better DSCs: ringing and slight color–shading in still images with tungsten light, as well as poor stabilization and staircase/aliasing effect seen in video. For all that the Samsung Galaxy S4 falls into second place in our rankings and continues to demonstrate mobile’s inexorable technological progress as manufacturers continue to place prominence on these devices for image capture. Impressive detail preservation in bright light conditions; the 13 M-pix sensor shows a significant improvement compared to the best 8 M-pix smartphone cameras. Autofocus is fast and accurate both in auto and trigger mode with little overshooting. Pleasing, rich colors with various types of lighting conditions. Good image quality with flash. Significant loss of detail in low light, due to excessive noise reduction. Strong ringing artifacts (over-sharpening halos). Slight color shading noticeable under low tungsten light levels. Visible aliasing and staircase effect. Strong noise levels in low-light conditions. In low light conditions, AF operation occasionally failed to adjust focus distance.